1. We are informed by Members of Bar that they have not been circulated cause list of today's cases and that's why some of them, having not received any communication through message in time, are not in a position to appear and argue their cases which are fixed for today. 2. We called upon Registrar (Listing) and he has informed that despite information given to Joint Director, Government Press, Prayagraj, U.P., no intimation has been given by him and he has also not made available today's cause list to the Court. 3. We, therefore, direct Joint Director, Government Press, Prayagraj, U.P. to appear before this Court today itself at 12.30 PM. 4. We have taken this step suo motu for the reason that non supply of cause list to the counsels as also to the Court is causing obstruction in administration of justice and this is nothing but a clear contempt of Court on the part of Official concerned. In re: Obstruction in publication of cause list due to alleged abstention from work by employees of Government Press. 1. This Court has taken suo motu cognizance of factum of non-supply of Cause List of today's cases by Government Press and called upon the Joint Director, Government Press, Prayagraj, Uttar Pradesh. 2. Sri Dinesh Chandra Pandey, Joint Director is present before the Court and informed that employees of Government Press have gone on strike from the morning of 06.02.2019. Though cause list of 07.02.2019 was printed but could not be bound and, therefore, not supplied and this disturbance will continue further. 3. He also placed copies of letters dated 06.02.2019 sent to Court, wherein, according to him, he informed Registrar (Listing), High Court, Allahabad that due to strike of employees, supply of the cause list is affected. 4. When we asked him as to what arrangement he has made for running Government Press if some or all employees are abstaining from work or on strike, he could not give any details of such arrangement and said that only R.A.F. has been deployed to maintain law and order. He also stated that he came to know on 05.02.2019 about probability of employees going on strike and prior thereto he had no such information. 5. He also stated that employees are abstaining from work and causing closure of Government Press under the leadership of Ajay Kumar Bharti, Administrative Officer, (District President) Government Press; Ram Sumer, Pradhan Sahayk and Ramesh Shankar Srivastava, Compositor. 6. The Employees, if are dissatisfied with terms and conditions of service with Employer, it is always open to them to negotiate with Employer or to take such steps as permissible in law. An employee may also abstain from doing work by staying at his home or staying at any other place and to not attend the office but these abstentions can be classified in two categories; firstly after obtaining leave sanctioned by competent authority; secondly absence / unauthorized absence which may also result in break in service. A collective abstention from work and thereby causing closer of the Institution and paralyzing other Institutions is nothing but a gross illegal and unlawful activity which is liable to be taken care in accordance with the law by competent authorities and bodies. 7. It is really surprising that no action has been taken by Head of Government Press in this regard to ensure that functioning of Government Press should not have affected otherwise. Moreso, even State Government has failed to take any action. 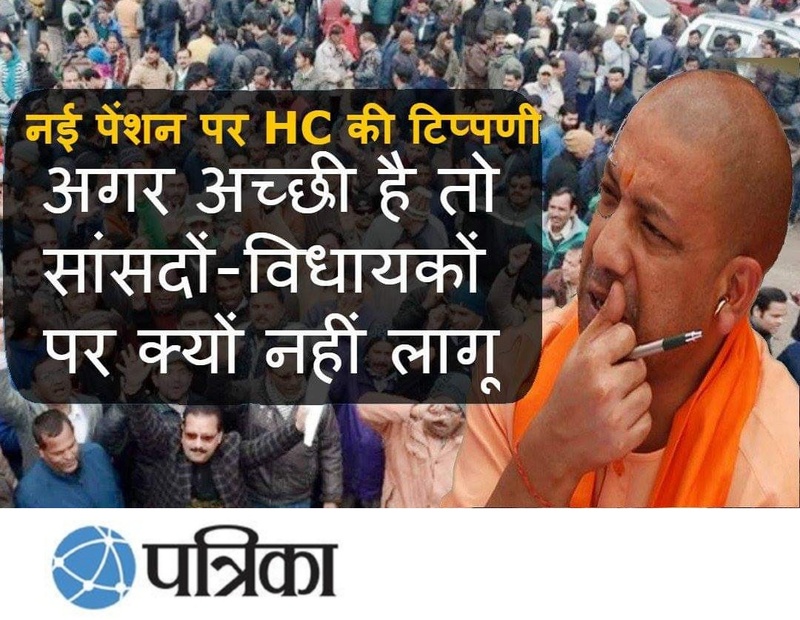 In this case, the above illegal action of employees has caused obstruction in administration of justice by virtually paralyzing functioning of this Court by non-supply of cause list whereby advocates get information of the cases listed. This is, besides other, also amounts to a criminal contempt of this Court. 8. As per information given by Sri Dinesh Chandra Pandey, Joint Director, Government Press, who is present before Court collective abstain and obstruction in the work by the employees is laid by the aforesaid three officials. We issue notices to be served through Chief Judicial Magistrate, Allahabad upon the above three persons, namely Ajay Kumar Bharti, Ram Sumer and Ramesh Shankar Srivastava to show cause why appropriate action be not taken against them by causing closure of Government Press resulting in non-supply of cause list of today to this Court and this amounts to contempt of this Court for which further action be taken. This notice shall be served upon them today itself and these three officials shall appear before this Court tomorrow at 2:00 p.m. Senior Superintendent of Police, Allahabad shall ensure its peaceful compliance. 9. We also direct Joint Director, Government Press to employ daily wagers or otherwise requisite staff, in whatever manner it is permissible, to ensure printing and publication of cause list. It would also be open to treat obstruction caused by the employees as deliberate unauthorized absence amounting to misconduct and take appropriate punitive action against them. If the striking employees are on contract basis or daily wage basis, he can take action by simple order of termination. 10. However, we are not expressing any final opinion as to how he would act but it is open to him to act in a proper manner but he must adhere to his responsibility that he has to ensure proper functioning of Government Press so as not to cause any hindrance in functioning of this Court. 11. We also place on record that Registrar (Listing) has informed that directions of Hon'ble Chief Justice in this regard was communicated to Joint Director, Government Press, Prayagraj, Uttar Pradesh that publication of cause list shall not be stopped and this was communicated, vide letter dated 6 February 2019, by Registrar (Listing), High Court, Allahabad. 12. Office shall register this matter with the heading "In re: Obstruction in publication of cause list due to alleged abstention from work by employees of Government Press" as "Public Interest Litigation" and after nomination from Hon'ble Chief Justice, place before appropriate Court, tomorrow at 2:00 p.m.
13. The Joint Director shall also remain present tomorrow at 2:00 PM. 14. A copy of this order shall also be communicated by Fax, today itself to Principal Secretary, Infrastructure and Industrial Development, Chief Secretary Uttar Pradesh, Lucknow as well as Principal Secretary, (Home) for information and necessary action. 15. A copy of this order shall also made available to the learned Standing Counsel today itself.